Cross-reactivity of 25-hydroxy vitamin D2 from different commercial immunoassays for 25-hydroxy vitamin D: an evaluation without spiked samples: Cavalier E, Wallace AM, Carlisi A, Chapelle JP, Delanaye P, Souberbielle JC. Clin Chem Lab Med. 2011 Mar;49(3):555-8. Epub 2011 Feb 3. 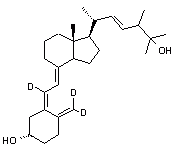 Description: A labeled metabolite of vitamin D2. Converted in the liver. Levels are measured in serum to determine a personâ€™s vitamin D status.